The Daily Kos proves the point here. I love it. Fox News is reporting that the Democratic leaders in Congress are seething over Dennis Kucinich for dragging impeachment onto the political stage. 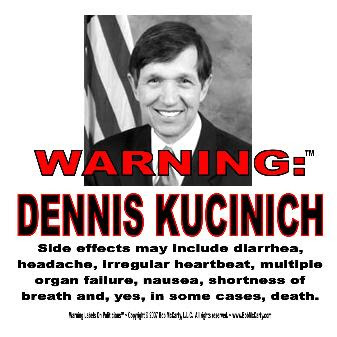 Kucinich is an embarrassment to the party. He’s like the Crazy Aunt who spills all the family secrets. They want him to go back into the attic. Republicans are handing him a megaphone. Spill, Auntie Dennis, spill. Democratic Congressman Alcee Hastings had the line of the day. Hastings was impeached as a federal judge over bribery before he was elected to Congress, where bribery is called campaign contributions. Irony, Dennis Kucinich barely survived a recall vote midway through his one 2-year term as mayor of Cleveland in the 1970s. Exactly so. I will add that the singularly WORSE “majority” led CONgress in the history of the United States, finds it to be a good thing to waste tax payers funds chasing UFOs, strawmen and shadow boxing. And they dare whine about GWB’s approval ratings. Pathetic. The Newsblobbers drivel the usual idiocy. And, you MUST go over to Redstate!! And, oddly enough, I agree, mostly, with Talk Left!! […] Bottom line is the Republicans turned the tables on the Democrats and forced them to vote to send it to the Judiciary Committee to kill it. Wait for the netroots reactions, I will update with them as they come in. Kucinich becomes Snooper’s second recipient of the Rubber Chicken Award, as initiated by my friends at Wake Up America.